Last week, I bought some dry garbanzo beans at the grocery store and planted them. Will they grow? I don’t know. But I have reason to believe so: Beans are seeds. And I’ve grown other types of dry beans bought at the grocery store in the past, like black beans and pinto beans. In addition, I’ve grown sweet potatoes, Irish potatoes, garlic, tomatoes, peppers, butternut squash, as well as some fruit. But why? 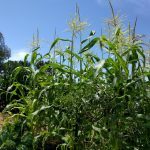 Why not just buy seeds from a seed company or plants at a nursery? I certainly do that too. In fact, alongside the peanuts above I grew black peanuts from seed I’d bought from Baker Creek, but for certain crops there can be an advantage in sourcing your garden starts at the grocery store. Sometimes it’s cheaper. This is true for beans, including garbanzo beans. 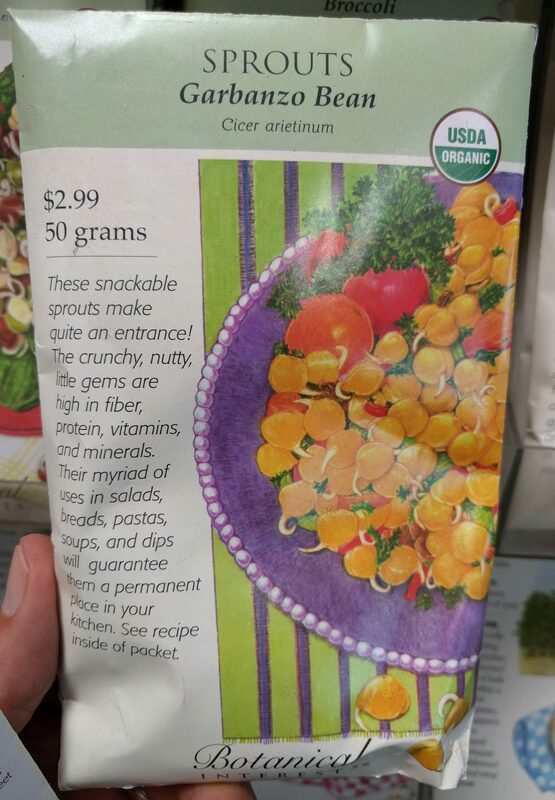 Here is a packet of garbanzo bean “seeds”, priced at $2.99 for 50 grams. 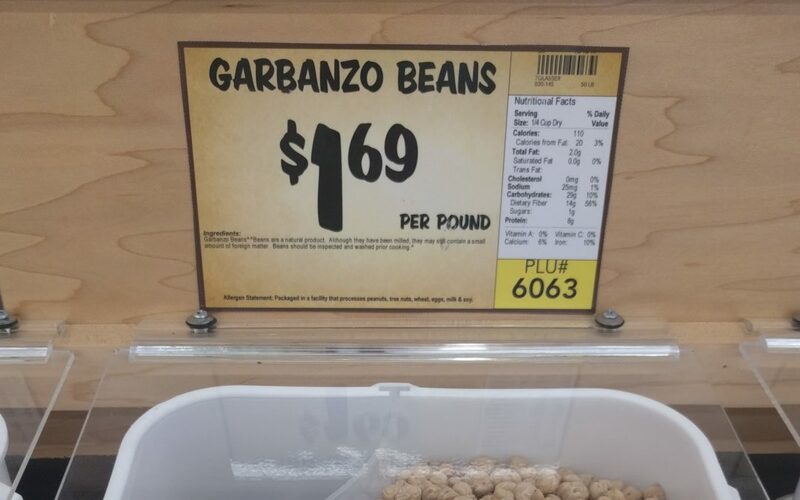 In contrast, from the bulk bin at my local grocery store, garbanzo beans cost $1.69 for one pound. If you bought one pound of garbanzo beans in the above seed packets they would cost $27. That’s a massive price difference. Same goes for garlic. Buying seed garlic at my local nursery costs $4.99 for a bag with four heads in it, which means it’s more than one dollar per garlic head. On the other hand, heads of garlic at the grocery store cost $0.33 each. So, I grow most of my garlic either from heads that I’ve saved from my garden the previous year or new heads that I buy at the grocery store. We’re comparing apples to apples here, it’s important to note. Garbanzo bean “seeds” are just dry garbanzo beans, and “seed” garlic is just a dried head of garlic, same as you’d buy at the grocery store. In addition to saving money, sourcing some of your garden plants at the grocery store can be more convenient. That’s the main reason I start many of my potato plants using potatoes I buy at the grocery store. Potatoes are always available there, 365 days a year. 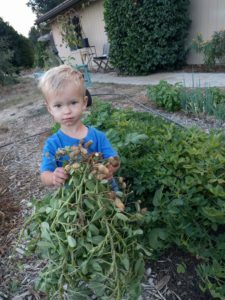 However, many seed potato sources have limited availability that is especially incongruous with our potato-growing season here in Southern California. For example, a seed company I really like called High Mowing only ships potatoes after April because of the danger of them freezing in transit through the winter. (High Mowing is located in Vermont.) 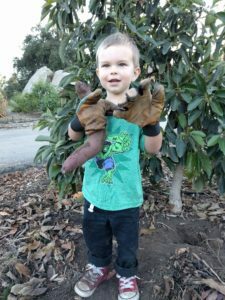 But February is the best month to plant potatoes here in Southern California. If you want to grow sweet potatoes here in Southern California, you’re really strapped for access to starter plants, or “slips”. 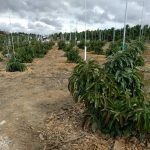 Try to order some online, where you can find the most varieties, and you’ll most likely find that the company doesn’t ship to California since our state restricts the importation of sweet potato plant material. The grocery store, on the other hand, can supply you. 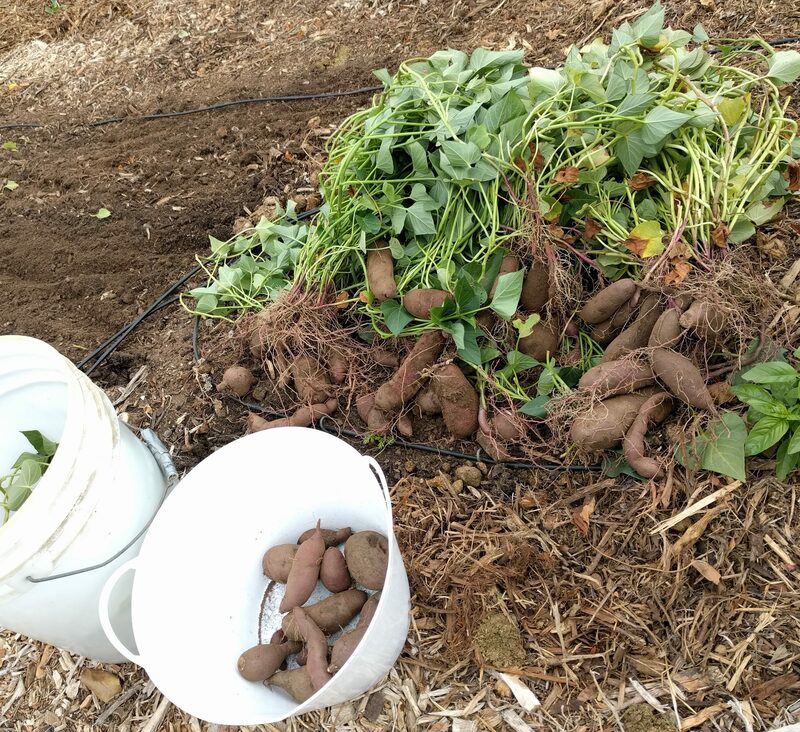 Buy any type of sweet potato you like there — just a regular old sweet potato tuber that you’d cook and eat — and you can grow your own plants from it, for eternity. The purple sweet potatoes below came from a single purple sweet potato I bought at a farmers market some years ago, that I’ve been growing every summer since. 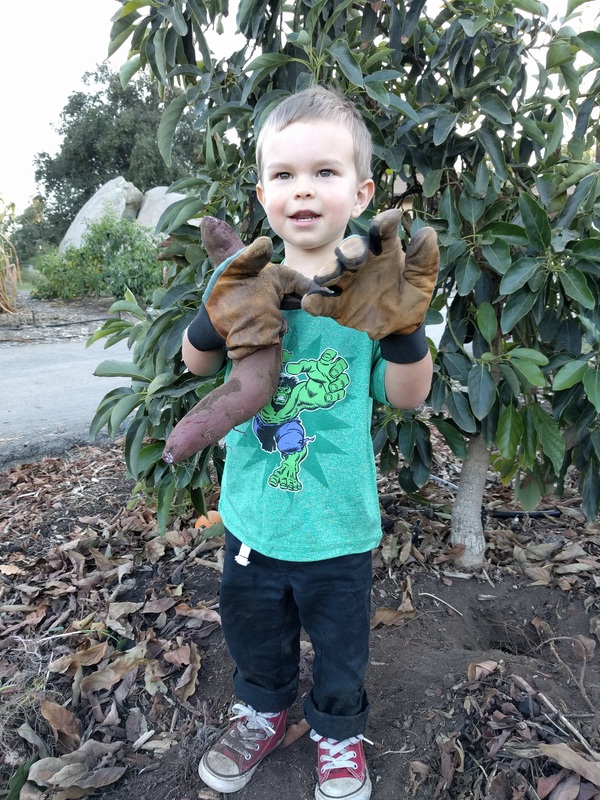 Cass dug up a big one last year, using Dad’s gloves. Are there any times we shouldn’t use grocery store produce to grow new plants? Maybe. 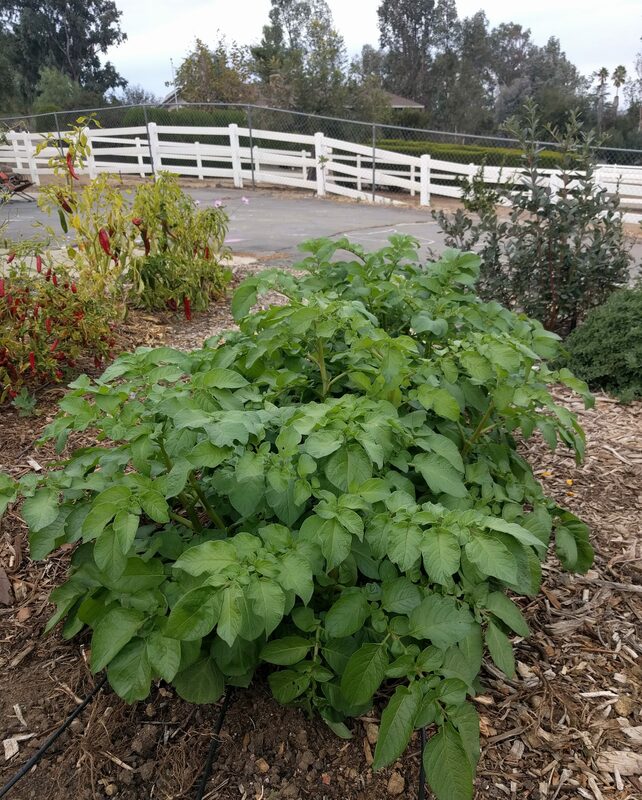 If you read resources on growing potatoes, for example, they will tell you to use only certified seed potatoes because they are free of viruses. Here is one such publication on growing potatoes from the University of California. I imagine the authors of this publication know very well what they’re talking about, and there’s certainly no benefit in introducing a disease into your garden. Yet, I started growing potatoes before I ever heard this advice about certified disease-free seed potatoes and I never had a problem. So I’ve continued to do so, for about a dozen years now. 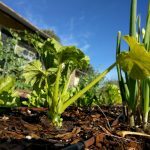 Maybe I have healthy, lively soil that combats the viruses well? Maybe the virus threat is more serious for farmers that grow potatoes in the same place year after year after year? Maybe I’m stupid? How about fruit? 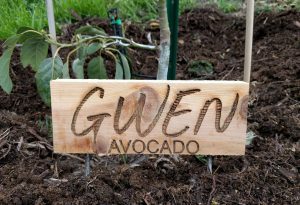 Can you, say, grow a peach tree from a seed inside a peach from the grocery store? Sure can. 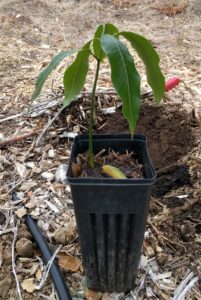 The only thing to be aware of with fruit seeds is that the trees they grow usually don’t bear fruit exactly like the fruit from which they came. Sometimes the new tree bears fruit that’s better, but more likely the new fruit isn’t as good. 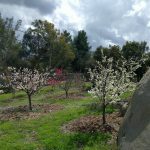 Sometimes you get lucky though, as my friend Frank did with a seedling peach he grew. Its fruit is so good that I’ve grafted it onto my own peach tree. 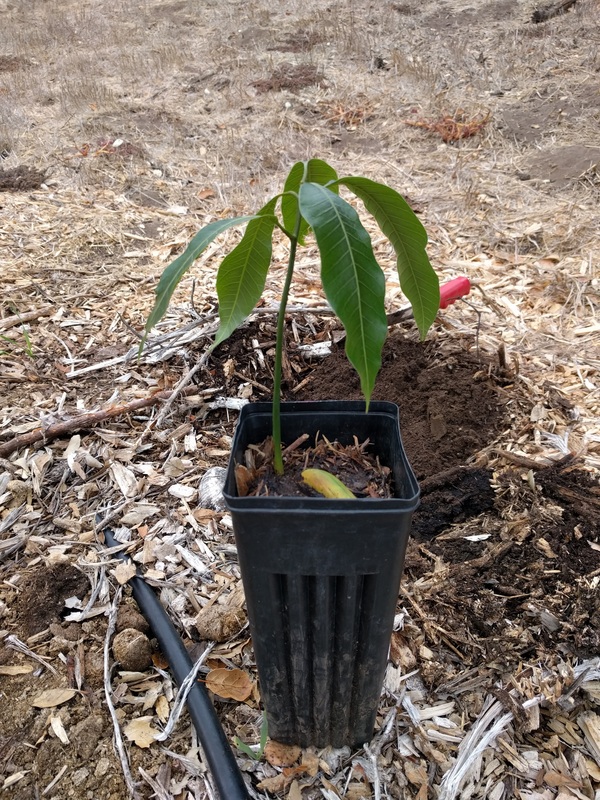 I grew this little mango tree from a seed of a Keitt mango I bought at the store a few months ago. Maybe I’ll get lucky like Frank and it will eventually bear delicious mangos for me. Maybe not. But what are we gardening for anyway? Isn’t a part of the fun the process of discovery with each seed we sow?